People with vision challenges may choose contact lenses over eyeglasses for a variety of reasons. For some occupations and activities, contacts are simply easier to manage. Many contact wearers also find they see better with contacts due to the reduction in glare and distortions. And some people simply prefer the look. 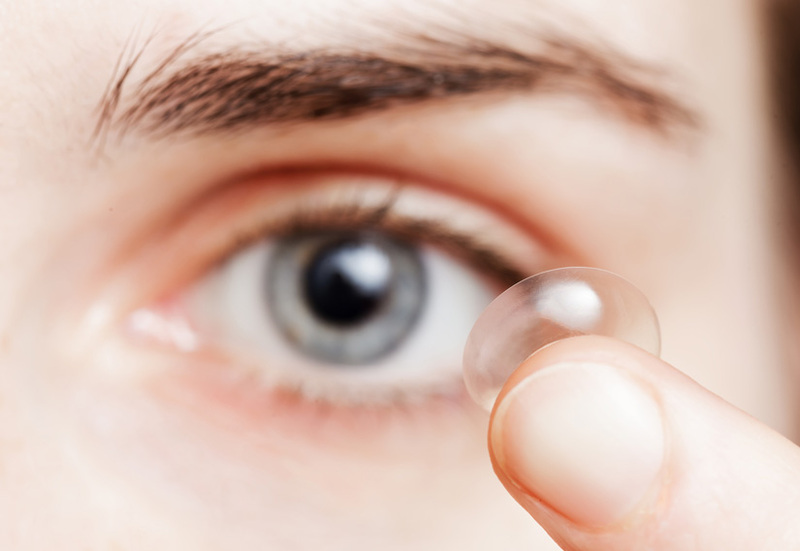 One of the first choices you will make with your eye doctor is whether to go with soft or hard contact lenses. Soft contacts are made out of light, flexible plastic infused with water to allow oxygen to flow through the lens. This helps keep your eye healthy, and makes the lens comfortable to wear for extended periods. Some brands can be worn for days without needing to be removed. Soft contacts are also very easy to put in, and tend to stay in place well. Like eyeglasses, contact lenses are available in a variety of specialties. Multifocal contacts combine multiple prescriptions in a single lens to provide clear vision at all distances. Tinted contacts can improve contrast, compensate for color blindness or be used for cosmetic reasons. Hybrid lenses provide the best benefits of hard contacts with the flexibility of soft contacts. Talk to your eye doctor to determine if any of these specialties may be right for you. Soft contacts may last up to a year. Hard contacts often last even longer. Disposable contacts, on the other hand, last as little as a single day to as long as two weeks. The viable duration of your contact lenses can be impacted by the quality of the lens material, your lifestyle and the overall health of your eyes. Your eye doctor will work with you to set a replacement schedule. Whether you choose standard soft or hard contacts, you will need to follow some best practices to keep your eyes healthy and contact lenses in great shape. Always wash your hands with a mild soap and dry them with a lint-free towel before handling your contacts. Be sure to use contact lens solution, eye drops and cleaners recommended by your doctor, and never rinse your lenses with tap water. Just as important as cleaning your lenses is cleaning your contacts case. It should be cleaned well after every use, using either a sterile solution or hot water. For contact lens wearers, it’s especially important to visit the eye doctor at least once a year. Unlike glasses, contact lenses actually touch the surface of the eye, and to a degree, limit the amount of oxygen that makes it to the surface of the eye. Without regular monitoring this could impact eye health over time. If you are considering contact lenses for your vision correction needs, call North Florida Cataract and Vision Care today at 352-373-4300 to schedule a consultation. We have two convenient optical locations in Gainesville – on the corner of NW 8th Avenue and NW 43rd Street and in Tioga Town Center.